Stella worries about Michael, who is acting out of character, while Aunty Brenda and the newly flush Dai Davies lock horns during a fraught business meeting. Following on from the opening episodes, the second episode of Series Four is a transitional episode. It is essentially a way for the series to properly set up its new storylines. While this does forgive some of the disjointedness of the episode, it doesn’t forgive all the error that the series holds. Stella used to be focussed on the titular character and her family and the main problem with Series Four so far is that, it is isn’t focussed on Stella. While Series Three focussed on Stella’s relationship with Michael (Patrick Baldi) and how her family reacts to this relationship. 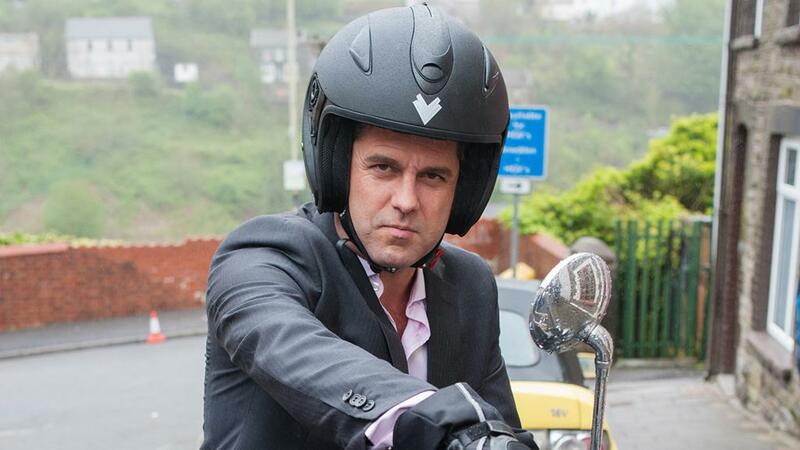 So far, Series Four has instead been about the side characters of the series such as Big Alan, Brenda, Dai Davies etc. This means that the audience’s attention is not on the main character but rather on the secondary characters meaning the series overall storyline feels disjointed. In other words, instead of focusing on our main character, it focuses on other characters that aren’t as necessarily interesting. Another problem that the episode, and so far the series has, is that it creates artificial conflict between the characters. Rather than simply creating a more natural tension between Stella and Michael, instead the writers make Michael act out of character. He doesn’t attend an auction evening set up by Zoe. He spends all his time cooking at Big Al’s café and buys a motor bike. For someone who apparently has so little money that he has to set up shop in his girlfriend’s house, Michael doesn’t seem that concerned by how much worse off he’ll be by buying an expensive bike. All of these things seem out of character for him and simply exist to cause friction between Stella and Michael. Obviously, this paves the way for her to be involved with a new love interest but if the writers wanted to shake up the series they should have attempted to make sure that the transition seemed more likely. As I said at the start of the review, this episode of Stella is a transitional episode. It is attempting to close certain storylines (such as the storyline with Stella and Michael) and open up new possibilities for the series. Hopefully, it will be successful in this and once again the series will be back to its quirky, normal self.